In 1981, the United Nations Educational, Scientific and Cultural Organization (UNESCO) designated the ancient Haida village of SGang Gwaay (Ninstints) as a World Heritage Site. As of 2007, SGang Gwaay is one of only 14 sites in Canada that has achieved this international recognition; the most significant global designation that any site can receive. As of June 2003, there are 754 places worldwide that are inscribed on the site list, including the Great Barrier Reef, the Great Wall of China, the Pyramids, the Galapagos Islands, the Grand Canyon, Machu Picchu and Stonehenge. The Canadian Minister of the Environment announced in April 2004 that all of Gwaii Haanas may be added to this prestigious list. Canada and other countries have been requested to select new nominees for potential inclusion on the World Heritage List over the coming decade. Eleven sites, including Gwaii Haanas, were recommended by a Minister's Advisory Committee composed of Canadians recognized as leaders in their respective fields. The members of the Committee consulted extensively, and ensured that the sites were chosen based on the most stringent global criteria. "Gwaii Haanas represents more than 10,000 years of connection between land, sea and Haida culture. It possesses undisturbed old-growth temperate rainforest and a diverse marine life, and is a "natural laboratory" for the study of island ecology, biogeography and evolution. In few other places in the world can one experience such diversity of life and habitats - from undersea kelp forests, to old-growth rainforests. As one of the few places in Canada not covered by glaciers during the most recent Ice Age, Gwaii Haanas retains a unique assemblage of species, many endemic to the Queen Charlotte Islands (Haida Gwaii). Tucked on shoreline cliffs are some of the largest seabird colonies and sea lion rookeries known. The invertebrate life in the intertidal and subtidal zones is highly diverse, and the habitat supports migrating shorebirds and marine mammals, including killer whales and migrating grey whales. 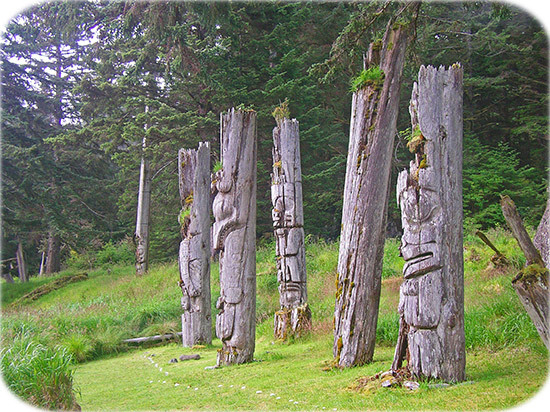 Traditional homeland of the Haida, the area includes remnants of houses as well as carved mortuary and memorial totem poles, commemorating the culture of the Haida and their close relationship with the land and sea. Like the mist that permeates the forest, the rich culture of the Haida infuses Gwaii Haanas. The existing SGang Gwaay World Heritage Site would be incorporated into this broader proposal." Because Canada is considered to be well represented on the existing list, UNESCO limits the number of nominated sites that Canada can recommend to a maximum of one per year. Thus, it may be some time before we find out if Gwaii Haanas’ nomination is accepted.